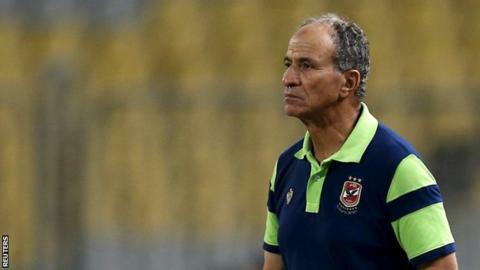 Al Ahly have sacked coach Fathi Mabrouk, after the Egyptian giants failed to win a major trophy for the first time since 2003-2004 season. Director of football Alaa Abdel-Salek was also dismissed following a board meeting on Monday. Former player Abdel Aziz Abdel Shafi - known as Zizo - has been drafted in as caretaker for the second time. He previously took over when Hossam Al Badry was sacked in 2010 but is likely only to be a stand-in. The trigger was defeat for the eight-time African champions in the Confederation Cup semi-finals by Orlando Pirates of South Africa. Pirates came back from two goals down to win the second leg of the tie 4-3 in Egypt. Ahly also suffered defeats to their arch-rivals Zamalek in the race for the league title and the Egyptian Cup this season. Mabrouk had only been in charge at Ahly since May, when he replaced Juan Carlos Garrido. Last season the club won the Egyptian league and the Confederation Cup but they failed to make it to the group stage of this year's Champions League. They also went on to win the local Super Cup with a win on penalties over Egyptian Cup winners Zamalek in November 2014. The new coach will have the chance of retaining that trophy almost immediately, with the 2015 contest set for 15 October at Al Ain's stadium in the United Arab Emirates.